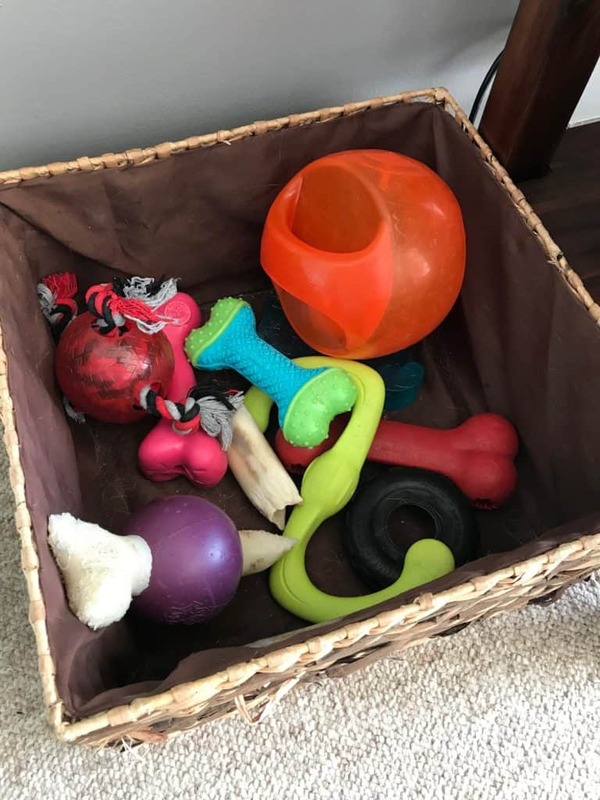 As a professional animal behaviorist and dog trainer, I often hear clients tell me that their dog does not like toys or quickly loses interest in their toys. I am going to show you how you get your dog excited about toys and how to use those toys to make both of your lives easier! First, you must realize that toys do not have intrinsic value. Meaning, dog toys are not necessary for your dog’s survival. Food and water have intrinsic value to your dog. They need it for survival. Your dog doesn’t have to be taught to eat. They innately know to do this. So, this means we often have to train dog to find toys rewarding and reinforcing! The dog was never trained to find toys rewarding. The dogs have access to the same toys day in and day out. <— Most common reason! Most dog’s wont have to be trained to find toys reinforcing. Instead, all you have to do is mix up what toys your dog gets, when they get them, and for how long. For example, my dog Callie has a huge box of toys in our pantry that she does not have access to. She has a box of toys in our living room that she does have access to. Callie’s box of dog toys that she DOES have access to. Each day, I replace 1, 2, 3, 4, or even all of the toys from the living room box with items for the pantry. This way, each day, there is a different variety of toys for her to interact with. This prevents her becoming bored with one toy because she always access to it. Think about people and television. I love watching TV! But, if my only option was to watch reruns of Will & Grace, I would eventually get bored. But because new episodes come out and there are other shows to watch – television doesn’t get boring. What I just explained is the best thing you can do for a dog that gets bored with toys. Two toys on their own may not be that interesting to your dog. Take two toys and put them together. Get as creative as you like! If your dog still isn’t loving their toys, then it’s time for some quick and easy training. My preferred dog toys are KONG dog toys ! 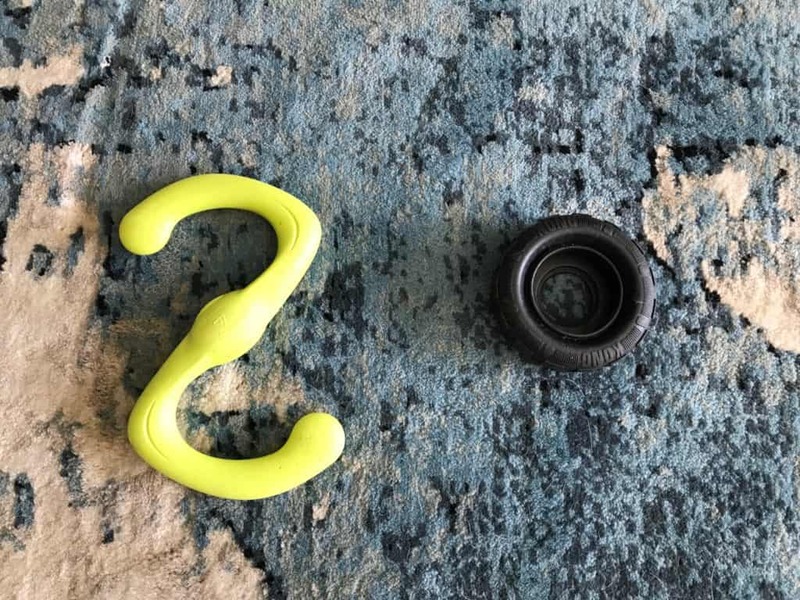 They are durable and have so many options. 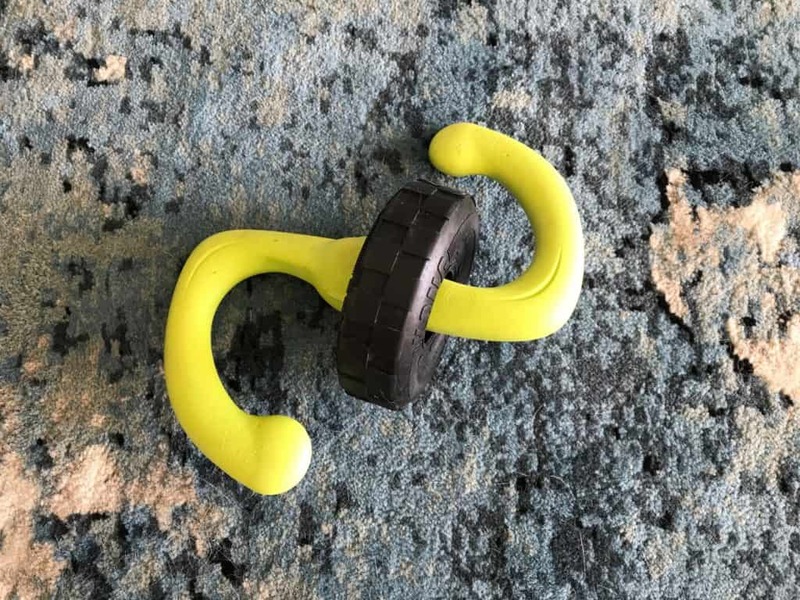 Pair your dog toys with things that your dog already finds reinforcing. Does your dog like to play or “rough house?” Grab a toy and start the fun! Does your dog like dog treats? Stuff those treats in your dog’s toys. Does your dog like to go outside? Train them to grab a ball when they want to go outside. Then, take that ball outside with your dog! One of my favorite activities to start training a dog to like their toys is to hold the toy in one hand and a treat in another hand. Encourage your dog to touch the toy (in anyway you can). Once your dog touches the toy, get very excited and give them the treat. Repeat this exercise until your dog is consistently touching the toy for the treat. Then, lay the toy on the ground and encourage your dog to touch the toy. Again, when your dog touches the toy, get excited and release the treat. If your dog picks up the toy with his mouth, heavily reward that and get even more excited! If you really want to make things simple, play with your dog and their toys before feeding times. When we place intrinsic reinforcement after toys (or any secondary reinforcer we are trying to make more reinforcing) we show the dog that good things happen when they interact with the toys. What most people do is, feed their dog and then give them a toy. When you do that, you can make food more reinforcing and you can actually decrease the value of a toy. I WISH my dog liked Kongs! Even with treats–GOOD treats–she doesn’t care. In fact, she often doesn’t care about treats at all, even those she does like. Same with food. And playing in general And THE pickiest dog I’ve ever met in 40 years. (The one I just lost was a lab mix, so I’m not used to this, lol. Dog practically has me cooking for her!) Newly adopted, so I’m hoping with time and reinforcement, we’ll get there. Just very hard to find anything that motivates her. Last year I adopted a dog around 1 or 2 years old. I don’t know how his life was like before or if it has anything to do with the fact that he isn’t interested in toys. Or playing at all. He never bites anything or anyone, he rarely barks and he is soo needy. He asks for petting all the time. I sometimes manage to get him running around happily, but is so hard, it happens like once a week or so. Also he is very smart, and learns really quickly. I taught him to sit, stand on his rear paws and all in less than a week! Why do you think he’s like this? Does anyone have ideas for some exciting toys I can get for my beagle? My 4 year old cavalier King Charles spaniel will only play with the same toy which is falling apart. I bought a new one that is exactly the same and he won’t touch it. How do I get him to play with a new toy?